Not only are these wall-mounted radiant panels functional, but they are also a much more elegant and safe way to add supplemental heat to an area than traditional space heaters. High-end LAVA infrared radiant panels are available in a variety of styles and sizes. Colored glass, lighted mirrors and Swarovski-crystal-encrusted panels are just some of the luxurious options that can add warmth to your home. By using the LAVA Towel Bar accessory your radiant panel can warm/dry your towels in between uses. Ember infrared radiant panels offer an affordable yet sophisticated heating option. 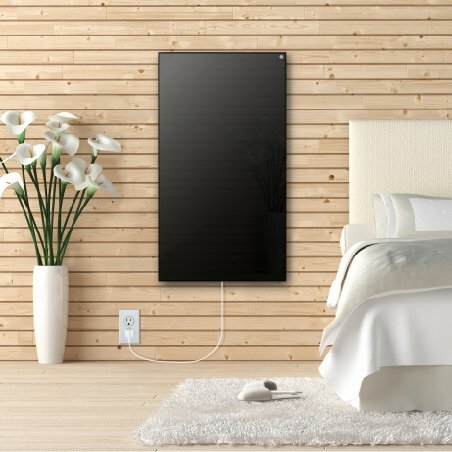 Available in black, white and mirror finishes, these panels bring clean, convenient heat to any room in your home. Use an Ember Towel Bar accessory to turn your radiant panel into a multifunctional area-heater and towel warmer. If you've ever stood outside on a cold day but felt warm because you were in the sunlight, you've experienced infrared heat. These rays from the sun heat the people and objects they come into direct contact with instead of the air. Infrared radiant panels operate the same way – except from inside the home. Wall mounted electric heaters work by heating the walls, ceiling and objects in a room, which store the warmth and then release it back into the room slowly and evenly. An electric wall heater offers additional benefits over both wall mounted gas heaters and wall mounted propane heaters because of the increased level of safety and consistency in heat output. This heating technique can save energy costs and eliminate the circulation of allergens such as dust. Plus, WarmlyYours radiant panels deliver these benefits in the form of modern, stylish panels. What Square Footage can a Wall Mounted Heater Warm Up? A wall heater will typically be used to provide supplemental heat for a room. You can kind of think of it as a wall mounted space heater. Use the table below to identify the typical room size* that an electric wall heater can help warm up. *This estimation is based on installing a radiant vent-free heater in a typical/average room. Actual results may vary based on a room's degree of heat loss, which can be impacted by a number of factors including ceiling height, number of windows, and insulation level. For a free Heat Loss Calculation based on your room, go here. All of our wall heaters can be easily mounted to a wall horizontally or vertically. Electric wall heaters have one of the highest efficiency rates that reduces heating costs. Our vent-free heaters won't disturb dust, pollen, or other allergens like forced-air systems. According to the U.S. Department of Energy, radiant panels have the "quickest response time of any heating technology." Our radiant panels our backed by our 5-year manufacturer warranty, that guarantees our radiant panels to be free from defects in materials and workmanship.